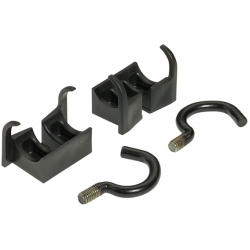 These kits are used to mount the AXA and other frame locks to a frame which doesn't have fixed nuts for that purpose. Type 1 : Original style with nuts, as shown in main image. A bit fiddly to fit. Only the size suitable for 12-14 mm tubes is now available. Good for seat stays of most traditionally built bikes. Can be taken off one bike and re-used on another. Works with most, if not all, ring-locks including the Defender, but not the AXA Victory due to its thicker mounting plate. Type 2 : Specifically designed to fit the the AXA Defender lock. No longer available.